6am alarm on Sunday feels all kinds of wrong. Wrong when I got into bed and count the number of hours zzzz I’ll get, when it starts ringing and when I peer outside my window and see that it is still dark. However, I know there’s got to be a really good reason why I’m dragging myself out of bed and if the reason is good enough, it will feel worth it. Blood Swept Lands and Seas of Red was all the motivaton I needed. 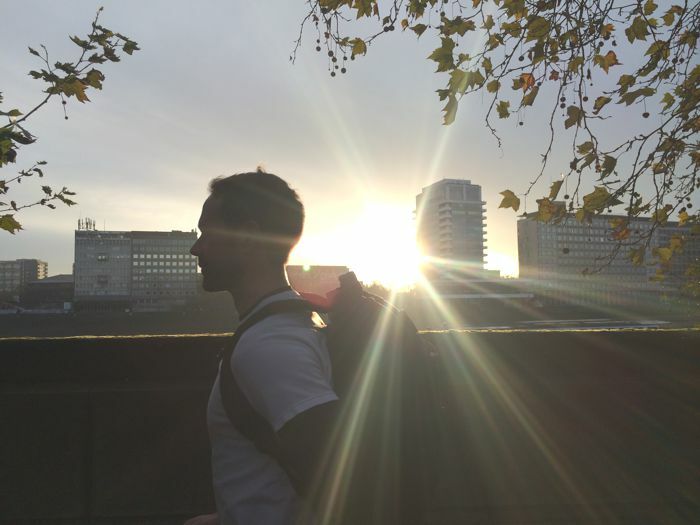 I've written in previous blogs on sunrise swimming and sunrise cycling, about how I love waking up before dawn to exercise. Not every day, but every so often to keep things fresh. Sunrise exercising gives you an opening to see the world in a different, and often, beautiful and calming way. I’d been running earlier in the week with my friend Joe so I knew he was up for running and wouldn't mind an early wake up call. He was at the pub watching the rugby and I was at a friend’s party when we arranged to meet up. Funny how when you’ve had a few drinks, the idea of waking up early and running from West to East London sounds so much more fun than it does the following morning. “Let’s get there for sunrise…” we chatted on Whatsapp. 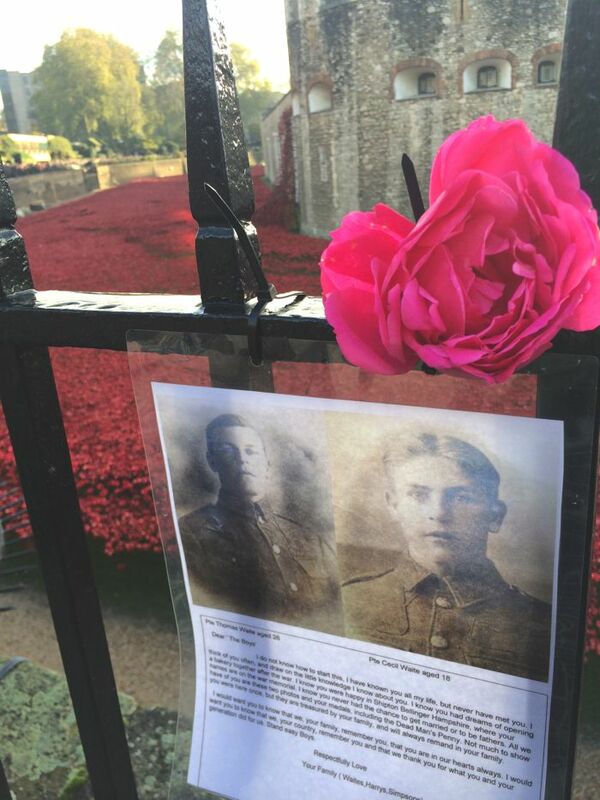 We arranged to meet at 6:30am the following morning and run to Tower London to see the poppies and mark Remembrance Sunday. At 6:20am, I was lying in bed still not dressed, but awake. Secretly hoping Joe would forget or decide not to come. I texted him and waited for a response. 5 minutes later I received this text. More time to cuddle my cat then. By 7:15 we were out my door and heading Eastwards. It was starting to get light but one of those heavy, grey mornings and a little damp. 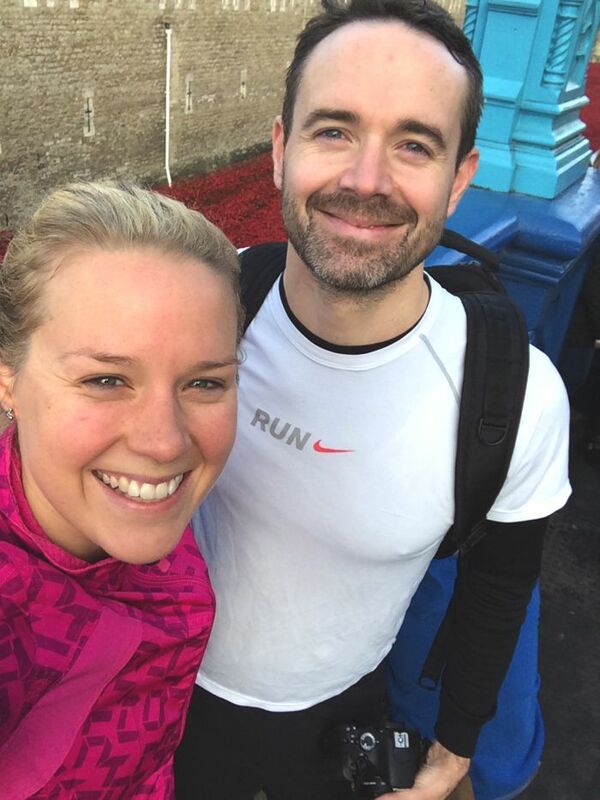 We left Fulham and hit the Chelsea Embankment, chatting away as we ran. I love that about running, how it can be a social event as well as a fitness session. Nothing quite like killing two birds with one stone! Often a counselling session too, somehow the road and the feeling of fresh air on my face opens up my mind and soul and helps me work through things that are concerning me. Do you know what I mean? Running past Battersea Power Station, it was well and truly light by now. The heavyness of the early dawn had dissipated and the sunrise was glowing on the River Thames. 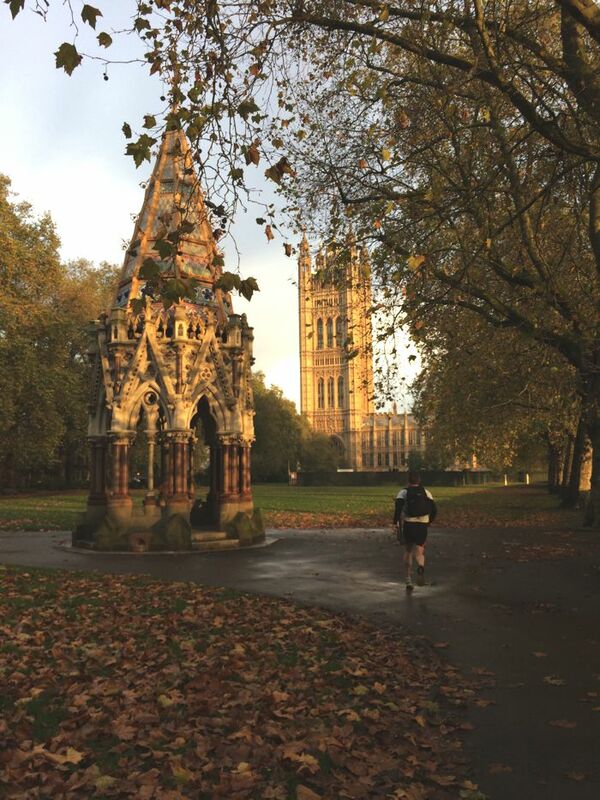 It felt decisively Autumnal with the leaves on the ground adding colour to the wet slate tiles on the pavement. The morning light filtering through the trees was beautiful and danced with us as as we ran past bridge after bridge. 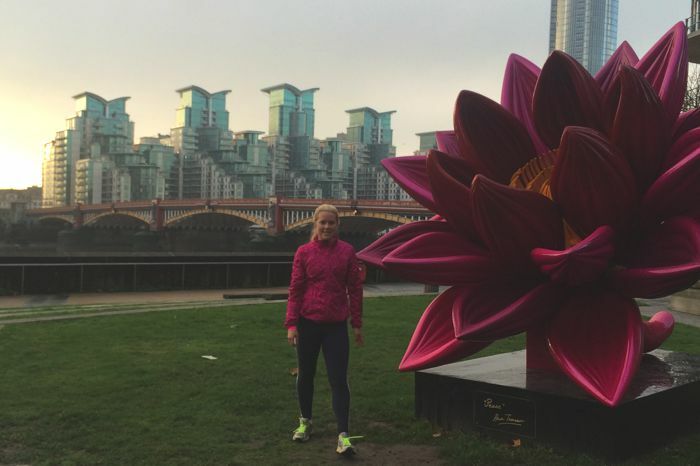 We spotted things we’d never normally see when flying past on other modes of transport, like this giant pink flower that happened to match my jacket and this cool painting of a Tower Bridge bus. As it was Remembrance Sunday and the whole purpose of the run was to see the poppies, I noticed far more war memorials than I might normally. Our country is steeped in history, but sometimes when I see the same things every day I become accustomed to them and don’t think about their significance as much as I’d like to. Today was different. 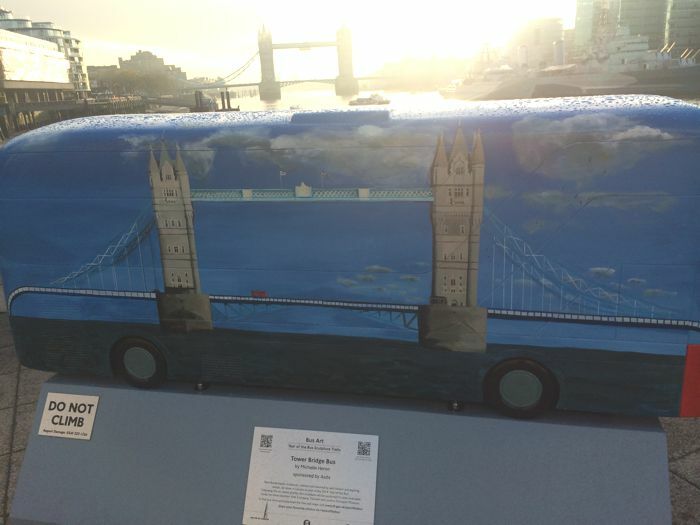 In the breaks in conversation I was thinking about reaching the Tower of London, what it would look and feel like when we got there. My social media feeds have shown plenty of pictures from people visiting the sea of red poppies, but it was the feeling that it would evoke that enticed me to see them for myself. 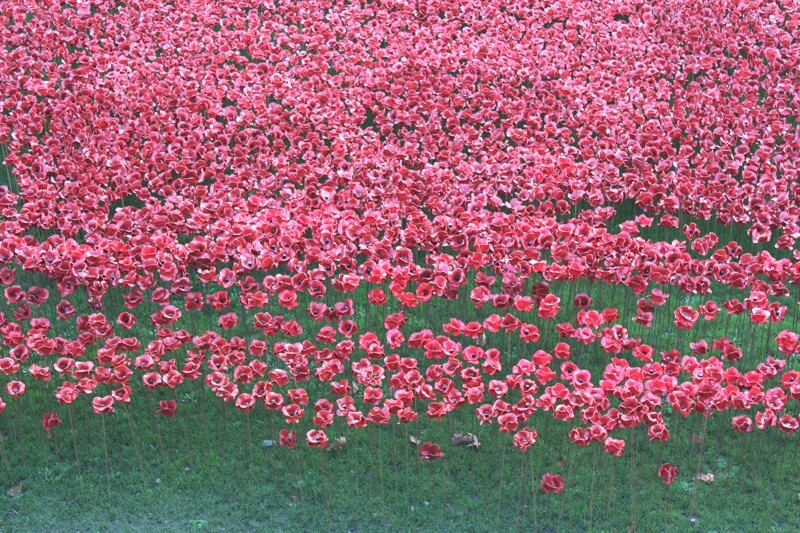 888,246 ceramic poppies, each poppy representing a British fatality during the First World War. A feeling of calm in the middle of a sea of thousands of people. Nothing mattered, nothing came into my mind. Just a few moments to be there and take it all in. I know it’s not possible for everyone to go and visit them, so I hope that by reading this and seeing these pictures you can feel you were there with me too. 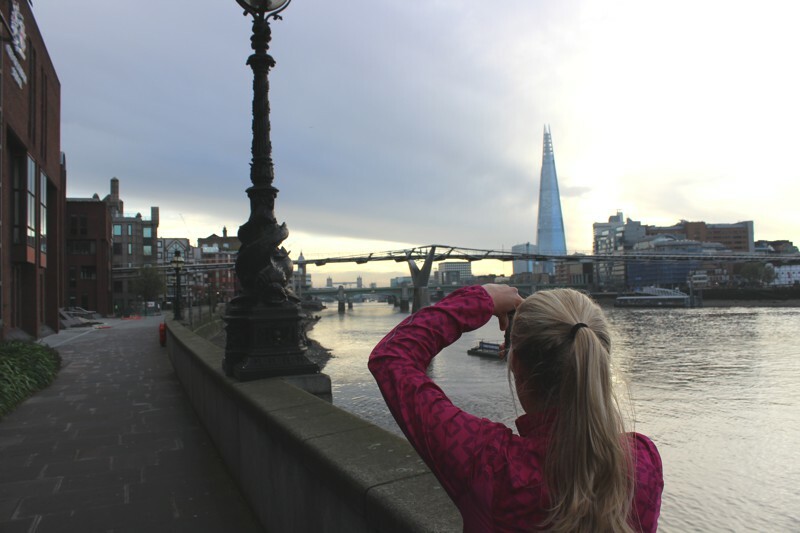 I love London, it’s been my home for 18 years and one of my favourite things to do is to run or cycle along the Thames. 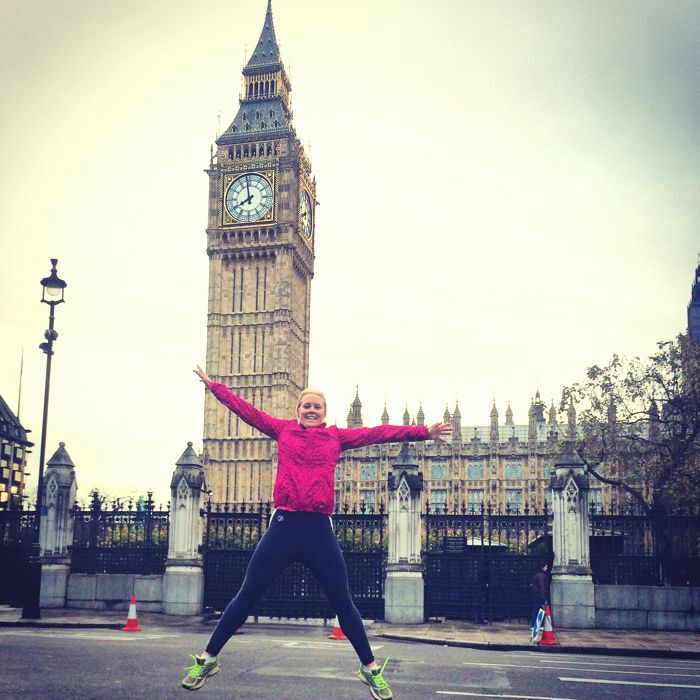 If you’re coming to visit London, and into your fitness, give yourself a cultural running tour – you can’t go wrong! Thank you Joe for coming with me and for some of the photos I've used.